now this is an interesting case. you'll have to read the property description in the petition (we believe that its probably the alexander fulton hotel and convention center and environs) but apparently, in 2007 the rapides parish tax assessor sent a property tax assessment bill relative to some city owned property, to someone named ken green up in pennsylvania who nearest we can tell is some sort of business analyst with a hotel company called the shaner hotel group limited. small problem. for whatever reason, mr. green and his group never paid the tax. another small problem, the louisiana constitution of 1974 article iii section 10(c)* provides in part that "no public property or public funds shall be subject to seizure." 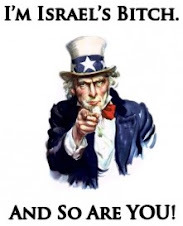 *the petition quotes article iii section 10(c) -- this is incorrect: the article in question is actually article xii section 10(c). see also heath vs city of alexandria. but that raises another question since article xii section 10(c) deals with "suits against the state" when the property wasnt sold off due to a lawsuit or court judgment. regardless, on 14 may 2008, the rapides parish sheriff "attempted to sell a 1% interest in the assessment property," to a mysterious company called symbiotic partners, llc. as you can imagine the petition isnt all that detailed but something happened the next year because on 13 may 2009, the sheriff sold "the assessment property" again and to another mysterious company called adair asset management/usbank. 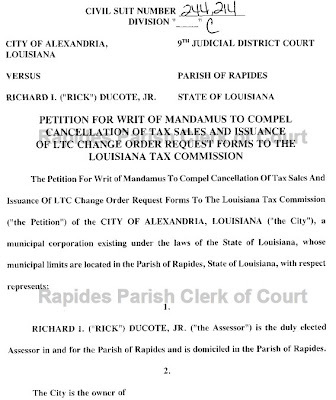 "the city requested the assessor cancel and erase the inscription of the 2008 tax sale and the 2009 tax sale and to issue ltc change order request forms to the louisiana tax commission annulling the 2008 tax sale deed and the 2009 tax sale ordering the refund of the property taxes paid by symbiotic partners, llc and by adair asset management/usbank insofar as the assessment property is concerned but the assessor refused the city's request unless and until ordered by the honorable court to do so." but our observation is, why, back in 2008 when this supposed tax delinquency business first arose and way before it was turned over to the sheriff, didnt the assessor simply pick up the phone and call the mayor or city attorney and say "hey something is screwed up with your property tax you all need to look into it."? it's possible that this could have been taken care of way back then and at minimal expense to the city taxpayers. now the city had to hire outside counsel, file a lawsuit, the assessor will probably have to have his own attorney and its a big mess. a big needless and expensive mess. 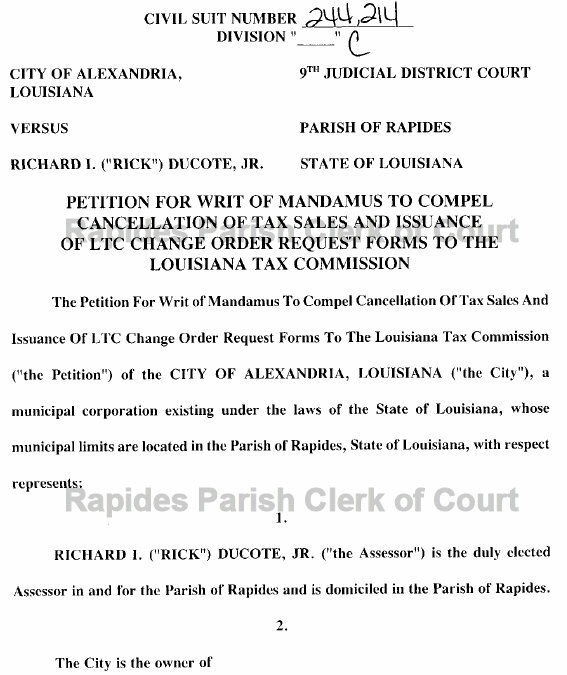 the filing attorney on behalf of the city of alexandria, la., is john w. munsterman, esq. and the petition is allotted to ninth judicial district court judge mary lauve doggett. a rule to show cause is set for 23 april 2012.